The first hour or so of Impact was very strong, with a number solid Bound for Glory Qualifying contests, along with a number of returns, a handful of good promos and a satisfying heel turn. Unfortunately the show went downhill after that with some strange booking logic, luckily the main event saved the second half of the show! After AJ Styles and Kurt Angle’s fantastic match at Slammiversary, I was extremely happy when TNA announced at rematch this week with the added stipulation of a place in the Bound For Glory Series on the line. With both men being big names within TNA, you’d have expected them both to be in the Series, therefore it was difficult to pick a winner for this one, which can’t be said for a lot of television contests. Throughout the show a number of elements were thrown into the equation including Rampage Jackson and of course, Aces and Eights. Firstly, we saw another confrontation between Kurt Angle and newcomer Rampage Jackson. Jackson went up to Angle and asked about what he meant last week. With Angle explaining it will take time before Jackson is ready to face him in the ring. This was basically to explain why Angle and Jackson won’t be facing each other for a while and why Jackson will probably disappear from TV for a while after this week. Secondly, Aces & Eight met in there “Club House”, which happens to be in biking distance of every arena in the United States. With the fall out of the Aces & Eight’s Battle Royal (more on that later) DOC revealed that tonight he planned to take out AJ Style’s as payback for the hammer shot two weeks ago. The main body of the match was much improved on the contest they had at Slammiversary with the action being a lot pacier and with less focus on the submissions of both men. The match was help by sticking to the close work of the Slammiversary contest, with both men delivering each of their moves with a menace which helped sell the feud as well as AJ’s new no nonsense attitude. Even when Styles’ went to a more familiar highflying style, it was to deliver a vicious looking springboard forearm smash. It’s always nice to see a good, close fought pure wrestling match, which doesn’t rely too heavily on major spots to keep the interest of the fans. This isn’t to say the match feature no spots, but they were well placed and well used, with a release German Suplex from Angle on the outside, as well as a repeated spot from Slammiversary with Styles flipping out of Angle’s German from the top rope. The ending saw the interference of Aces and Eights, but Styles quickly seeing away the oncoming DOC and Knux, whilst Angle got rid Mr. Anderson, only for AJ to get a quick school boy roll up for the victory and the spot in the Bound For Glory Series. I’d expect Style be near the top end of the Series with TNA playing off the idea that Styles will finally be able to challenge for the title once again. With Aces and Eights continuing the beat down on Angle post-match, it was Rampage Jackson who came to make the save, with Aces and Eights quickly scarpering. It was a slightly frustrating ending as it would have been nice to have clean win in this one, and DOC’s promise of getting AJ Styles quickly went out of the window. Hopefully we get another Angle-Styles match soon, before the two move onto new storylines. 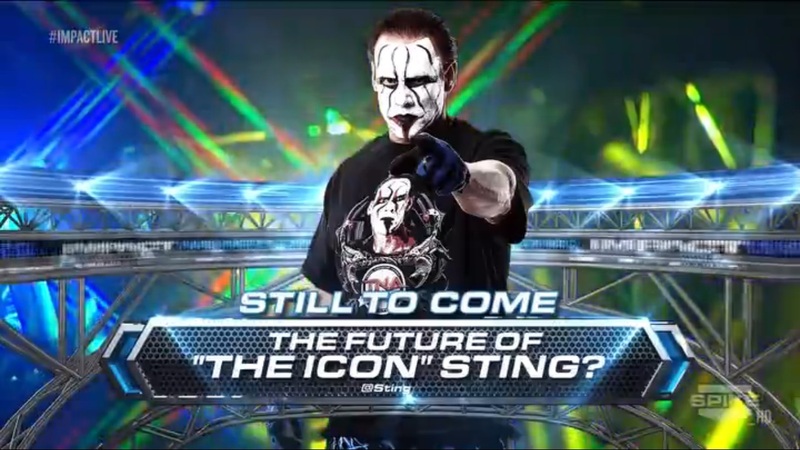 After Sting’s loss to Bully Ray at Slammiversary, it was clear that TNA would have to find a new place for The Icon heading into Bound For Glory, as well as storyline that had the legs to keep going for over four months. With Sting heading to the ring, it was clear that TNA were teasing that Sting would retire, but it was clear that that wasn’t the case. Whilst I wasn’t particularly impressed with Sting’s performance at Slammiversary, I still think that Sting could have something to offer TNA in other roles. It would seem that Sting and TNA management had been reading my review of Slammiversary, in which I questioned why no one from TNA had come to help Sting during the World Title match. With Sting bringing this up and it being the main catalyst for the promo. It seemed for a while as if Sting might have been teasing a heel turn, talking about how Aces & Eight were a family and how no one had his back. I’m glad TNA didn’t go down this route as I’ve never been a fan of Sting as a heel, his character works much better in a face role. The big reveal was Sting announcing that he was planning on reforming a new version of the Main Event Mafia. For anyone who wasn’t around TNA 2008-2010, Main Event Mafia were a heel stable of former World Champions who battled with a number of TNA’s younger stars (known as the TNA Frontline) throughout that period. The stable was led by Kurt Angle, and then Sting before eventually disbanding shortly after Bound For Glory 2010. In terms of member, the Main Event Mafia was a much stronger looking faction than Aces and Eights and were booked a lot stronger as a group and individuals than the new group as well. However, hopefully by placing Aces and Eights against the group it should help to elevate some individual members who have been used as fodder over most of the storyline, like Knux or DOC. Now, who will Sting choose to join his new version of the Main Event Mafia? Well, the only members still contracted to TNA are Sting himself, Kurt Angle, Samoa Joe and Taz. With Taz closely connected to Aces and Eights and playing a strong role on commentary it will be unlikely that he joins the group. With other former members like Kevin Nash, Booker T, Sharmell and Kip James currently connected to WWE they are surely also ruled out. With Scott Steiner being the only big name left in the group, it’s also unlikely he will make his TNA return after his recent lawsuit with TNA, and other names like Traci Brooks, Jenna Morasca, Sally Boy & Big Rocco hardly being big enough names to mean enough to warrant returns. If the Main Event Mafia sticks to having former World Champions within its ranks, Sting could also look to the likes of Abyss, AJ Styles, Austin Aries, Bobby Roode, James Storm and Jeff Hardy. As well as a likely pick for General Manager Hulk Hogan, although I’d rather see him stay out of this storyline. The show kicked with Hulk Hogan in the ring talking about the Bound For Glory Series. He announced that only two wrestlers had gained automatic spots in the Series, the previous winners Jeff Hardy and Bobby Roode. With Hardy and Roode both coming out to state their case in the Series, Hogan announced the return of Open Fight Night next week, with the audience being able to choice whether Roode or Hardy got the first call out. I enjoy the Open Fight Night concept and it will definitely help to keep the show fresh over the next few months, but having the audience vote for Roode or Hardy seems almost as pointless as some of WWE’s Active votes over the previous month, with the outcome of not just the vote, but their calls outs being obvious. Aces and Eights came out with Bully complaining that no one from Aces and Eights had a spot in the BFG Series, with Hogan agreeing to give them a spot to the winner of battle royal between the group later in the night, much to the disdain of the group. With Aces and Eights picking their winner via a card game, the battle royal was a bit of piss take match in all honesty. With Anderson pretending to throw the other members out, with over reactions from all of the group. It was of course not a fantastic match, but made sense in terms of the way the group works. That was until DOC decided to refuse to leave the ring and went to war with Anderson, who easily despatched of him for the win. It made little sense for Aces to stay on the outside, when they’ve had no aversion to interfering before and with Anderson quickly gaining the upperhand it made it feel all a little pointless. Another Bound For Glory Series Qualifying Match saw Bad Influence faces World Tag Team Champions James Storm and Gunner, with both members getting a spot in the Series if they were victorious. With Bad Influence providing another entertaining contest prior to the contest, with Daniels playing a piano, that they must have found someone where in the arena, whilst Kaz talked up why they were going to win the match later on, with some hilarious references to Gunner’s beard and it’s ability to scare old people. Personally, for the last year, or even since their formation as Bad Influence, Kaz and Daniels have been the most entertaining part of Impact almost every week, both in the ring and during interviews. For most of the opening of the bout, Bad Influence worked over Gunner, keeping him in their corner and performing your regular heel tag team maneuverers, until Gunner managed a double clothesline to tag in Storm. Storm who is clearly working with an injured leg, looked a little awkward in the ring, but has to be commended for his effort during the contest, when he could have easily done less than he did. The ending came with Storm building for a Last Call Superkick, only for Daniels to hit him in the back with the Tag Title belt and Kaz to get a Small Package for the three count. It makes sense for Bad Influence to go into the Bound For Glory Series, as Storm clearly would struggle with the work load of so many singles contest. Hopefully Kaz and Daniels go far in the tournament, although I wouldn’t hold my breath with the way Daniels had been treated by TNA over the years. Also this week, we got the payoff on Mickie James’s heel turn. With Velvet Sky and James both having backstage segments building to a meeting in the ring, with Sky promising that she had a present for James. That present turned out to be a letter from Sky’s doctor clearing her to compete, thus allowing Sky to finally have her rematch for the Knockout’s Championship. With James eventually snapping and saying Sky was still injured, whilst attacking Velvet’s knee. It was a good segment and felt like a satisfying build, with James being allowed to grow into her new heel character before fully making the turn. I expect James to retain the title and see her moving into a feud with Taryn Terrell come Bound For Glory. There was also a Four Courners Match with another Bound For Glory Series spot on the line, pitting Matt Morgan, Rob Terry, Magnus and Kenny King all against each other. Morgan cut a promo backstage before the match stating how he had been held back by Hogan and that he shouldn’t even have to qualify, it was a good promo from Morgan and it really is time TNA started doing something with the giant whose been floating around the sidelines since his return. The MVP of this contest for me was Kenny King, who pulled the match together with some sneaky heel antics, and without this the match would have felt completely out of place. I’m not a huge fan of the Four Corners Match, especially without an elimination element, as having to tag in and out doesn’t make much sense. The end saw the classic breakdown, with various finishers from each competitor, before Magnus hit the Mag Daddy Driver on King for the victory. I’m a big fan of Magnus’ in ring work, but can’t see him picking up too many points in the series, although he will hopefully have some good matches along the way. With Morgan now out of the Series, I can see a fued with Rob Terry that will do little for either man, whilst Kenny King will most likely return to the X Division. In another Bound For Glory Series Qualifying Match we saw the return of Eric Young return to take on Austin Aries. Young is probably one of the best in this business at the moment in terms of comic ability, with some hilarious spots incorporating ODB as well as a nice section with Young copy catting Austin Aries mannerisms, including lying on the top rope. Aries and Young put on a very good short television contest that was a joy to watch at time, combining the comic elements with some nice serious grappling, with the crowd clearly loving both of the competitors in the ring. Aries eventually picked up the win, by running into the rope with Young on the top rope, and finishing off with a Brainbuster. Aries will be near the top of the Bound For Glory Series, but I can’t see him getting the win in this one somehow. Another returnee for a Qualifying Match was Crimson, who hasn’t been seen in over a year. Crimson cut some very good promos both backstage and in the ring before his match, and he has clearly been working on this side of his game during his time in OVW. His opponent was Joseph Park. The match was short with Crimson dominating and looking impressive throughout, until Park ducked a clothesline and rolled Crimson up with a school boy for the surprising win. It seems a strange decision to bring back Crimson for this and hopefully he sticks around with something else to do, possibly involving former partner Matt Morgan. Joseph Park seems like a strange decision for the BFG Series and I wouldn’t say I’d look forward to his matches in the Series, although I’d expect the reveal and payoff of the Park/Abyss story before the conclusion of the tournament. Elsewhere there was also a vignette revolving around Chris Sabin’s decision surrounding the X-Division Championship and whether he will get a World Championship shot. It’s still not clear when this will be happening with Destination X now defunct, but when it envitably does I can’t see Sabin winning the World Title, especially from Bully Ray as it stands. He’s entertaining in the ring and decent when talking, but I wouldn’t put him in the same class as Austin Aries who had the same decision last year. A loss would also help to build Sabin’s story and possibly give him momentum to build on heading into next year. What have we learnt for Impact Wrestling this week? 1. All participants in the 2013 Bound For Glory Series, not that all of them have a chance of winning! 2. Sting is sticking around for the time being and TNA is still in love with the NWO. 3. Mr. Anderson will be the first to betray Aces and Eights, although it might be teased that it's DOC.